Tiffiny Yang Aesthetics & Surgery has shifted! 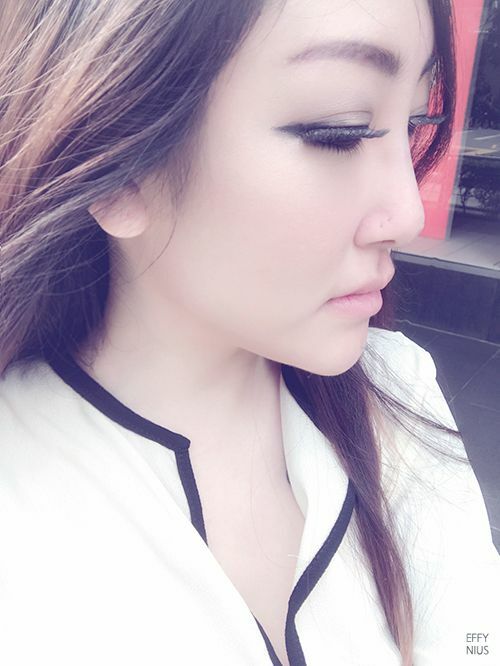 And so, I went for Nose Threadlift at Tiffiny Yang Aesthetics & Surgery last Friday, and I am absolutely loving it! 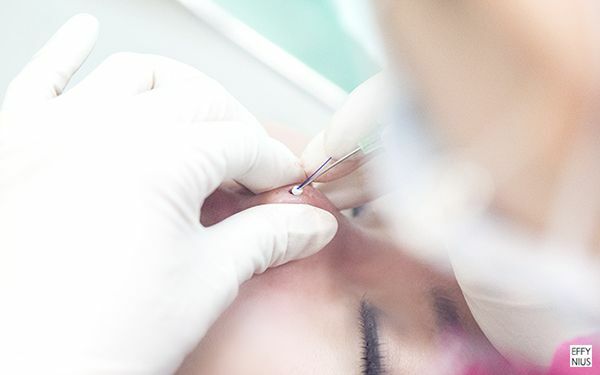 This is a relatively new procedure here in Singapore, while in Korea and Japan, it has been in trend for some time. 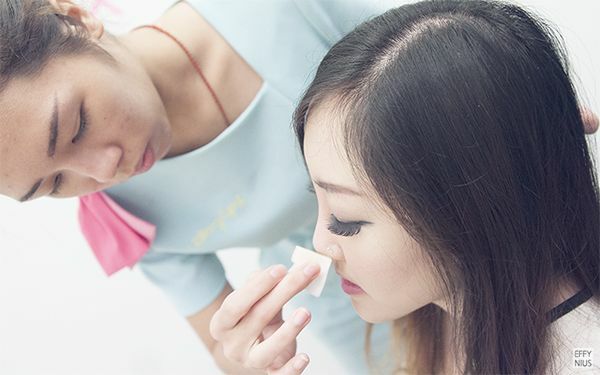 As compared to fillers, this has a more lasting effect, but together with fillers, Nose Threadlift has the best results for nose contouring and high bridge. Nose Threadlift is alike Rhinoplasty, but non-surgical and has practically no down time at all. It does not involve going under the knife if you are conservative and concerned about that. And the best thing is, without all of those scary things, it has about the same effect of a plastic nose job! Nose Threadlift is an aesthetic procedure that can improve your nose contours and also enhance the shape and height of your nose without surgery. 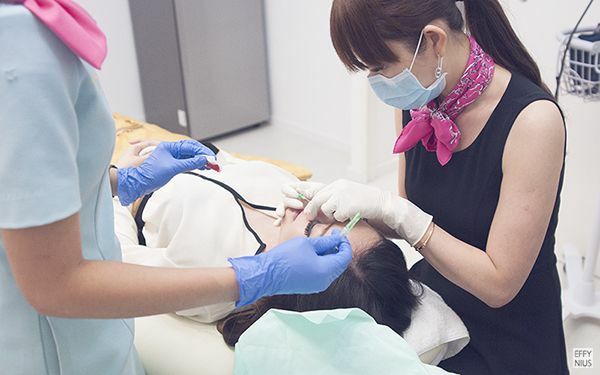 This is a very popular procedure in Korea and Japan. It is commonly known as the “lunch-time” nose lift in Korea and Japan because of its minimal down time. The procedure is specially targeted on giving you a straighter, higher and more defined nose bridge or nose tip. In addition, Nose Threadlift can also lift your nose tip and make it appear smaller and sharper. How does Nose Threadlift work? This is what the threads used in Tiffiny Yang Aesthetics & Surgery look like. It is important to understand the procedure that you will be doing. 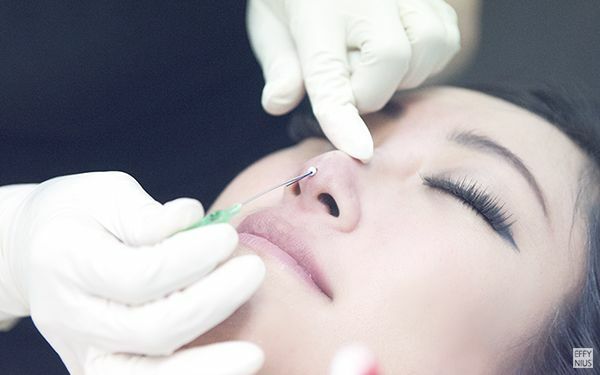 Before procedure, Dr. Tiffiny Yang accesses my nose and recommends what is good or bad for me, and what to expect and not. She does not insist to have me go through unnecessary procedures (which I greatly appreciate) and advised in honest opinion that I should not be doing more fillers on my nose bridge (which I wanted) – as there are still existing nose fillers. However, if your fillers have faded or have not done fillers before, it is highly recommended to combine both procedures together for optimum results. She explains that in my case, after years of fillers, the bridge broadens up over time. Nose threadlift at this point will be perfect for me – as this procedure aims to achieve better definition of nose shape as well as lifting bridge and tip – preventing my existing bridge fillers from spreading and widening. 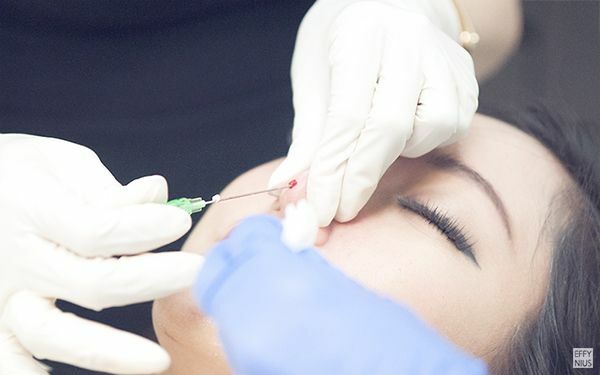 Most importantly, this procedure fixes the cleft on my nose tip better than fillers done alone – and so with fillers faded on my tip, it is best with the combination. She also patiently explains how the procedure will be done, making sure that I have all questions answered before proceeding. Before the application of numbing cream, makeup on areas receiving treatment is required to be removed. Numbing cream is then applied and to be left on for 15 minutes for reducing discomfort of anesthesia injections. Area to be treated is marked in white (not the usual blue ink) – indication of the ideal point for placing the Nose Threadlift. 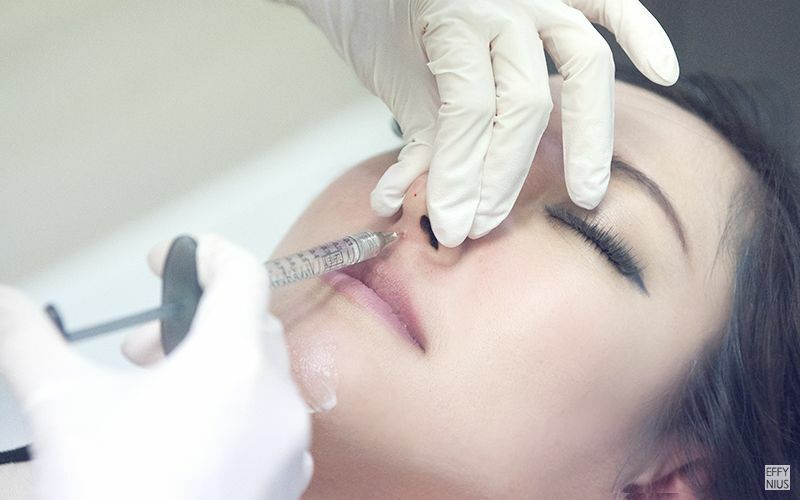 Local anesthesia is injected along the nose bridge as well as columella – numbing the entire nose area in preparation for Nose Threadlift treatment. Nope. 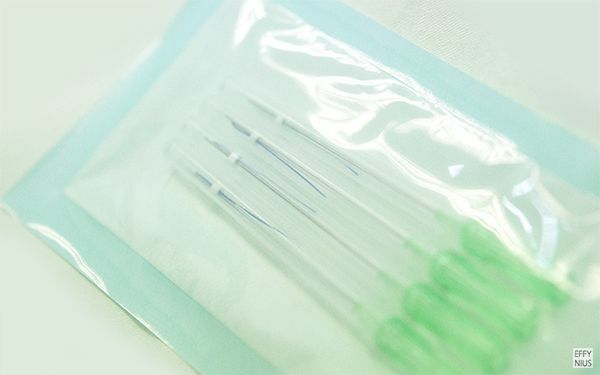 I can feel the needle poking in but there was no pain at all during the anesthetia injection – except for columella – which was a sharp pain but lasting only for a split second. I thank the numbing cream and her professionally steady hands. 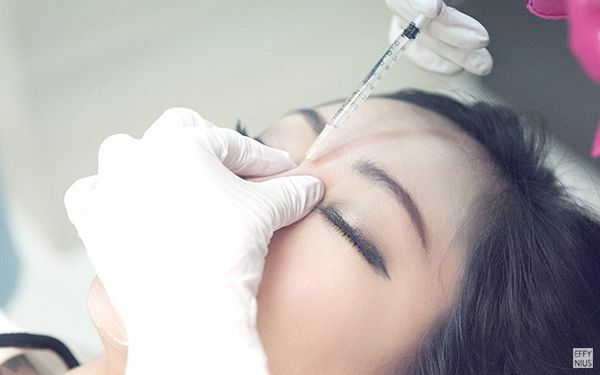 Step 1: A small injection is placed – only one point on the nose tip is required for the entire treatment procedure – before insertion of the Nose Threadlift. Step 2: The threads are placed horizontally into the nose bridge for contouring, definition, and shaping of nose. Close up shots of one point threadlift insertion. Step 3: The threads are placed vertically into the nose tip for lifting and sharpening of the tip. Step 4: Shaping the nose for the final look. The procedure is now completed! I have about 10 threads in my nose bridge and about 4 in the tip. The procedure is painless because of the local anesthesia on top of numbing cream. The entire threadlift procedure is done in under 15 minutes. You can obviously tell right after the procedure that I have a distinctively well defined nose from high bridge to sharp tip, and looking perfectly natural. Apart from the slight bruise (which practically doesn’t exist – much to my surprise) and main threadlift injection hole, you can’t really tell that I have done anything to my nose. Oh, and also, apart from my Nose Threadlift procedure, I had my touch up session of 1-Point V Face | Chin Filler + Botox Jaw as well. Hi, may i know how much do they cost and do they charge extra for extra threads? Hi, I live in Canada and can not leave my young son to travel, was wondering if you have trained any doctors in Canada and if so do you have any Canadian refferals for the threadlift for chin/nose? Is there a high chance for bruising? Are you using all blunt cannulas? It’s possible to get this treatment if my nose has filler? Hi I don’t know who is Dra but yes you can get this treatment done with fillers. I had mine with fillers and result is brilliant. 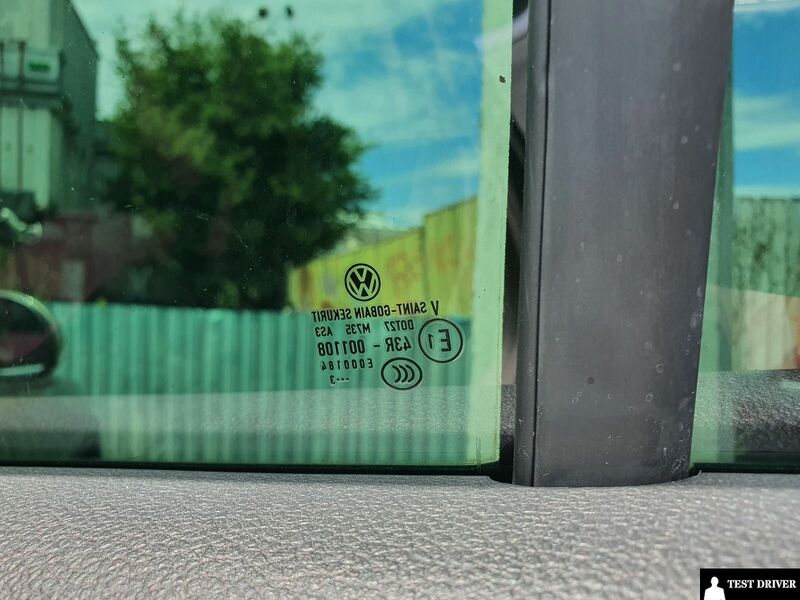 what is full nose $1000 included? May I ask if $1,000 from bridge to tip is inclusive of consultation and GST? Thank you for visiting! $1000 is before GST, so will be $1070 after. Consultation is $80 for first visit but can be waived if proceed with treatment on the same visit. It’s been more than a year after the procedure. How are you still liking your nose? Did you get it re-done again? You gave alot of confidence for me to proceed my appointment next week! Can you still do nose threading with nose fillers still in your nose ? Hi, was there any downtime for the treatment? Can you go out on the same day after the thread lift? Hi, I do have upturned nose tip, can it be fix by nose thread? OK, I still don`t get it… what is the difference between nose threadlift and rhinoplasty? And if I undergo a threadlift how long it will last? I did mine recently and had nose bleed during the process.